The Star Online/YouTubeWu Yongning performing one of his rooftop stunts. A “rooftopper” has died while attempting a stunt in China. The stunt was reportedly part of a £11,300 ($US15,000) challenge. He had hoped to use the money to marry his girlfriend and pay his mother’s medical expenses. A “rooftopper” died while attempting a stunt from a 62-storey building in China, his girlfriend has confirmed. 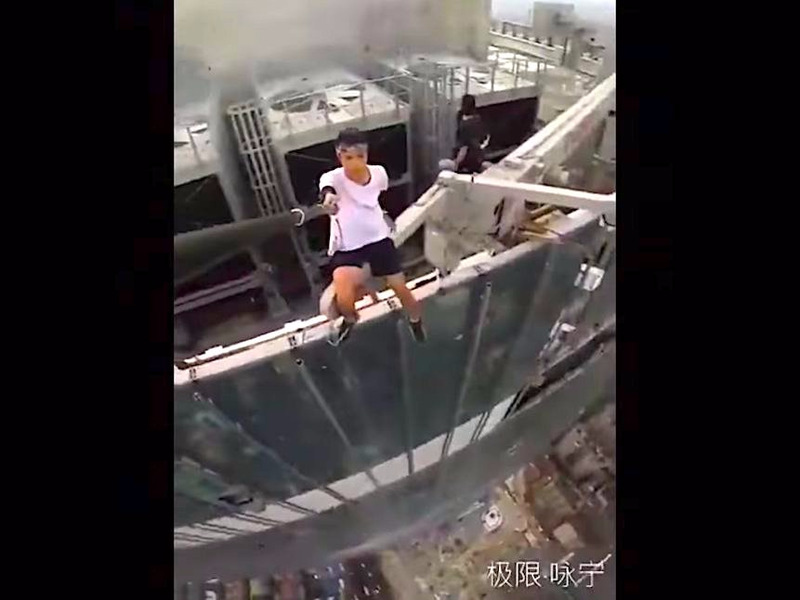 The fateful stunt had been part of a RMB 100,000 (£11,300/$US15,000) rooftopping challenge, his family said, according to the South China Morning Post. Details about the challenge and its sponsor remain unclear. Wu’s uncle, Feng Shengliang, said his nephew had planned to use the prize money to marry his girlfriend and to pay his mother’s medical bills, SCMP said. Wu had amassed more than a million followers on Chinese microblogging site Weibo, where he posted hundreds of clips of himself standing on or dangling off tall buildings without any safety harnesses. His followers reportedly grew concerned after he didn’t post anything for a month.